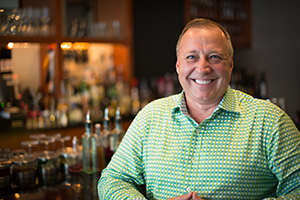 Dave Nicholas is a founding partner, primarily focused on operations, recruitment, talent acquisition, and concept development.Nicholas is a native of Rochester, New York, who began his restaurant industry career in South Florida in 1980, as a bartender. Bitten by the hospitality bug, Nicholas honed his skills and worked his way through a variety of restaurant roles that grounded him in the business while fueling his entrepreneurial spirit. He created training schools for aspiring mixologists and pursuing success with unique concepts. In 1992, Nicholas was appointed general manager of the original Café Tu Tu Tango in Coconut Grove, Florida, eventually being named as the Regional Manager/Director of New Project Development for the restaurant’s development group, based in Miami. In 2000, he took on the role of director of operations for Ghirardelli Chocolate Company’s Restaurant and Retail Division, supervising all aspects of this $30 million division. Wanting to leave all the travel behind, in 2005 Nicholas ventured into restaurant ownership with Himmarshee Bar & Grill, a critically acclaimed establishment in Ft Lauderdale, Florida, which he owned until 2012. In 2006, Nicholas joined forces with long-time friend and colleague David Clapp to create Bottom Line Hospitality (BLH), a restaurant management, operations, and development company, which owned or operated multiple restaurants in Florida, including Chispa, Bruschetta and Shooter’s Waterfront. Eventually, the two assembled a group to acquire the Café Tu Tu Tango brand, which brought them back to the genesis of their longstanding professional collaboration. In 2013, BLH, began working with the owners of Virtue Feed & Grain in Old Town Alexandria, Virginia, a modern American tavern, to turn around the fledgling concept. Two years later, the team more than doubled Virtue’s sales while turning it into an iconic destination restaurant. Realizing the tremendous potential in Northern Virginia, Nicholas and Clapp set out to grow their business in the area, and rolled BLH into Alexandria Restaurant Partners, LLC (ARP). Concepts currently under Nicholas’ leadership include Virtue Feed & Grain, The Majestic, Lena’s Wood-fired Pizza & Tap, Palette 22, Vola’s Dockside Grill, The Hi-Tide Lounge, Theismann’s Restaurant & Bar, and the recently opened Mia’s Italian Kitchen.